I’m originally from Estonia so I tend to cook a lot of Estonian meals, especially during Christmas time. Over the years Rob has come to love a few and dislike a few others. Closer to Christmas I’ll be making pate, sauerkraut and meat jelly, so stay tuned. This last one, meat jelly was the hardest for Rob to get used to but now he loves it. One of my favourite dishes is potato salad. 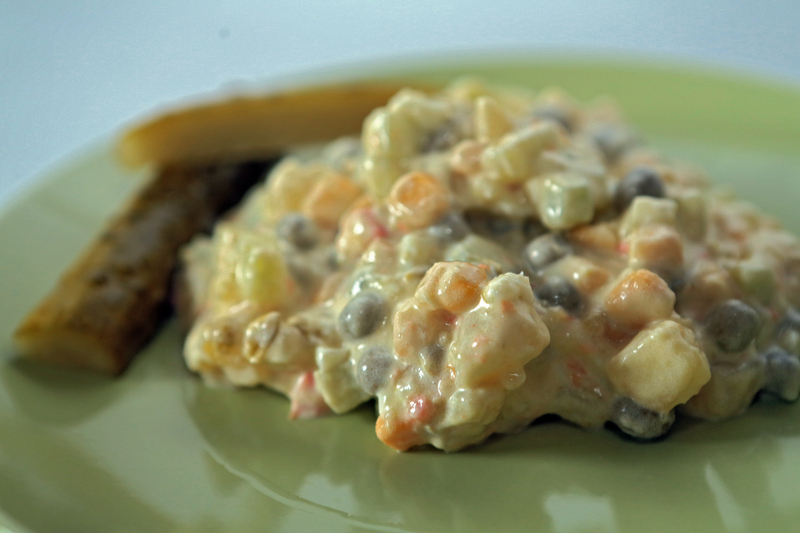 You would say it’s pretty typical recipe for Estonian potato salad! The good thing is that you can eat it for breakfast, lunch or dinner! And you can use all your favourite ingredients. I used to use apples, tomatoes and pickles but Rob did really not like it with them so I have decided not to use them any more. It´s still amazingly delicious! 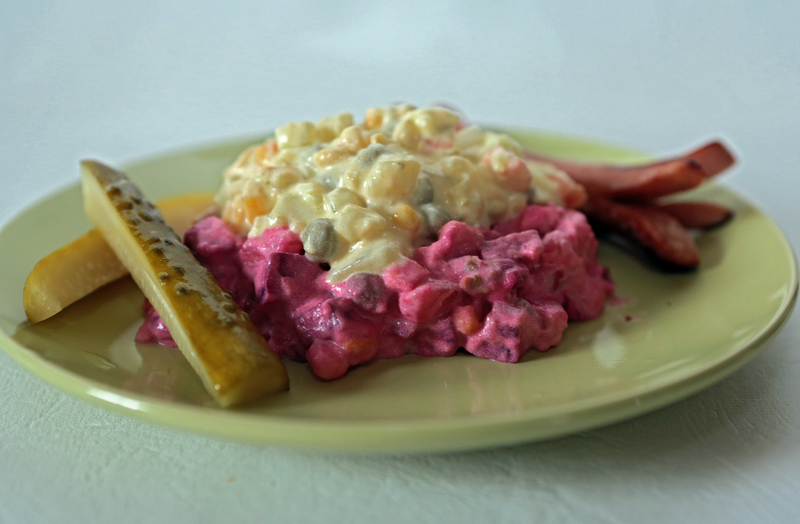 Sometimes I use beets as well, then it´s called Rosolje (potato – beet salad) 🙂 Originally you also add herring to it BUT although I like herring, I don´t like it in the salad. I usually just replace it with pork (boil it and shred it). For the dressing: mayonnaise, sour cream, salt (3 big tablespoons of sour cream and 3 tblsp mayonnaise, 0.5 tblsp of salt, pinch of sugar). You can also only use mayonnaise, up to you! 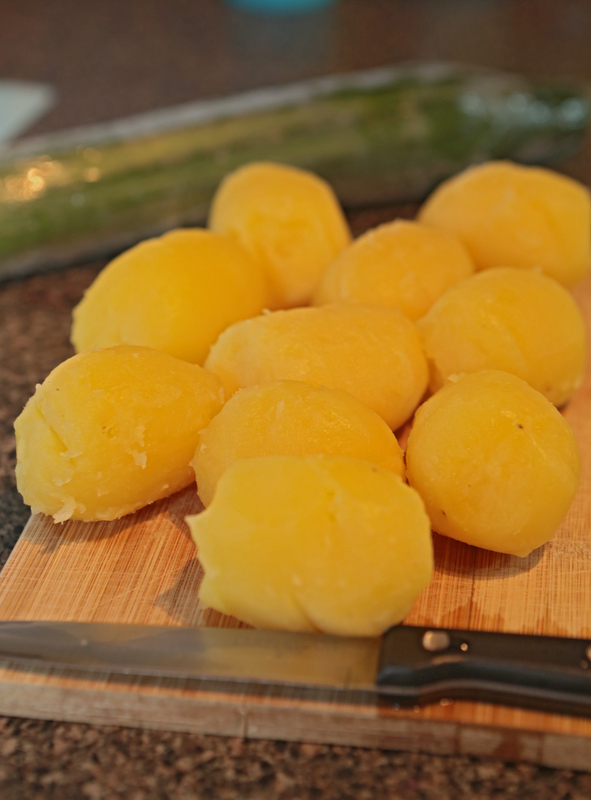 Step 1: Boil your potatoes, DO NOT peel them, boil them with skin on (you will peel them after they´re done). They taste much better this way! Step 2: Boil eggs (with shell on 🙂 ). Step 3: Peel your potatoes after they have cooled down. 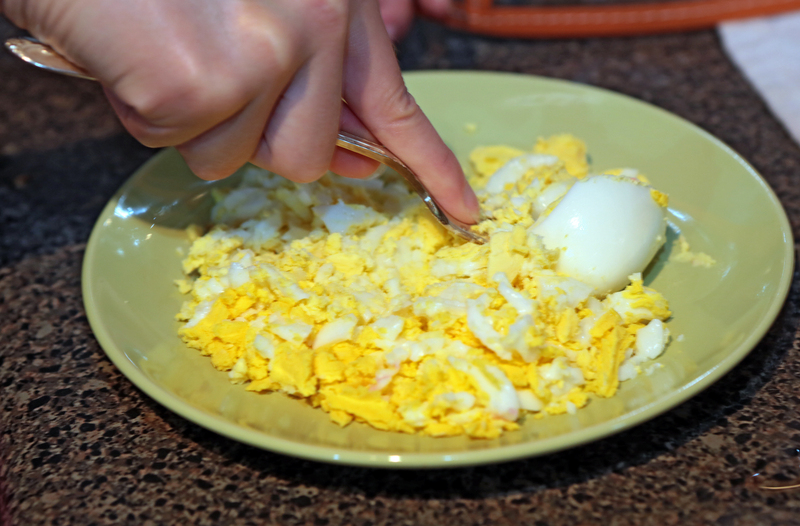 After peeling your eggs, use a fork to mash them. Cut the potatoes and a cucumber into cubes. Step 4: Put everything into a large bowl – potatoes, cucumbers, eggs, corn, peas and carrots. Step 5: Use another bowl to make the dressing . Mix together sour cream, mayonnaise, salt, sugar. *That’s what my mom used to do but sometimes I’m lazy and I just whip the dressing up on top of the potato mixture, not using another bowl. Saves time too when you start to clean up 🙂 I guess if you have done this potato salad long enough (like I have), you don’t need to use another bowl any more. Step 6: Pour the dressing on top of the salad! Mix well. Over time you will customize this recipe. Like I said before, try different ingredients (apples, pickles, tomatoes, wieners, chicken etc) and you will find the perfect potato salad recipe for you! If you like raw onions, throw them in as well! Interesting recipe. I’ve been eating Rosolje every Christmas since I was a kid because my Mom is Estonian. 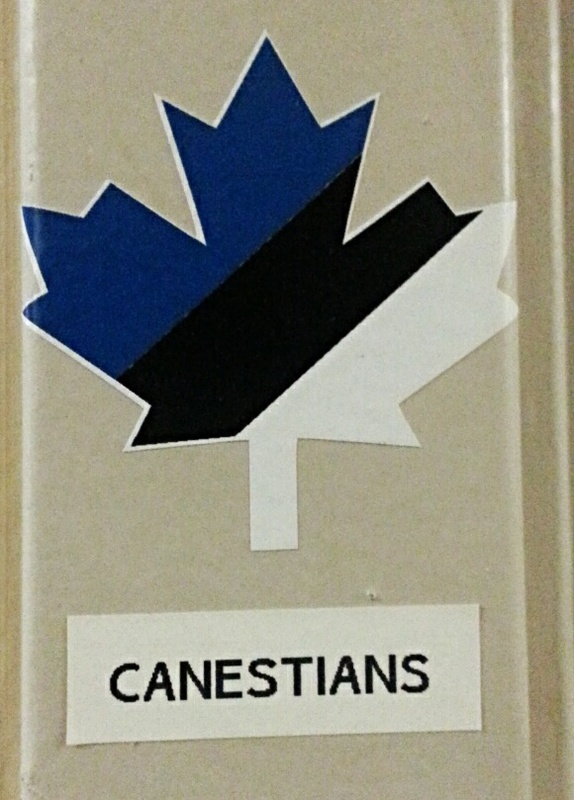 Can you tell me where you got the Canestian sticker? My mom actually said she saw one of these on a car and would like one herself.